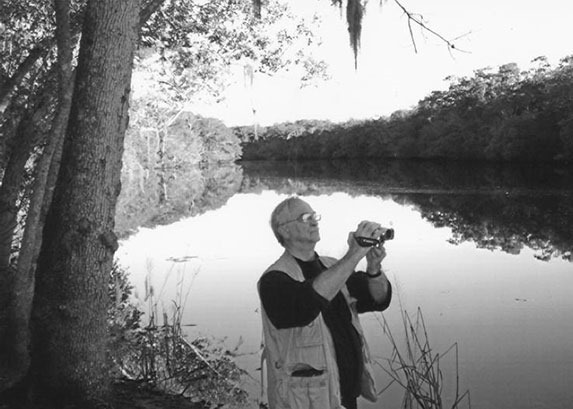 Home > News & Views, Other Blogs	> What has Joe Nickell Been Up To Lately? What has Joe Nickell Been Up To Lately? Lately? This page at CSI offers a quick review over the past year or so. I see nothing related to the Shroud. My favorite is his investigation of the Florida Skunk Ape. Here is a picture of him taking a picture of nothing in order to prove that skunk apes do not exist. I think I see an alligator just behind him about to eat him. Or is that just a pareidolia formed by swamp grass? Behavior. The Skunk Ape’s behavior is typically similar to that of Bigfoot everywhere. It is frequently seen standing among trees, crossing a road (and occasionally being hit by a car), rummaging in garbage, drinking water or catching fish from a lake or stream, visiting campsites, standing to peer into windows, and so on. It typically vocalizes by growling, grunting, grumbling, or producing “stressed breathing” and, at least once, “clicking sounds,” among others (although at times there is no sighting and so no certainty that the sound was that of a Skunk Ape) (Jenkins 2010, 111, 117, 123). I would have preferred if you had read something related to the shroud on the CSI website over the past year or so. It means Mr Nickell does not consider necessary to comment on any of your posts. Nothing new or of interest as far as he is concerned. Who cares what Mr. Nickels thinks, or considers necessary to comment on? So it means he will comment after the two Shroud conferences. Devastating News for the Mona Lisa? Is She or He a Photograph? Nutellagraph? Did STURP Check for Nutella and Butter Knife Strokes?